Later today, June 26, marks the launch of Bitdefender Total Security 2013, a robust consumer cybersecurity suite for Windows machines. (Yes, it will even work with Windows 8.) This year’s version includes a number of slick new features, improved malware scanning, and a slew of tweaks. But is it the right antivirus software for you? Here, I provide a thorough, concise run-down of the features, and my impressions of Bitdefender 2013’s usability. First, make sure your Windows system is current with all the necessary systems updates. I made the mistake of trying to install Bitdefender 2013 before realizing that I needed to install a whole slew of Windows updates before it would work. This added a couple of hours onto the process, so if you’re in the same boat I was, think about downloading and installing your Windows updates well in advance of snagging your copy of Bitdefender. 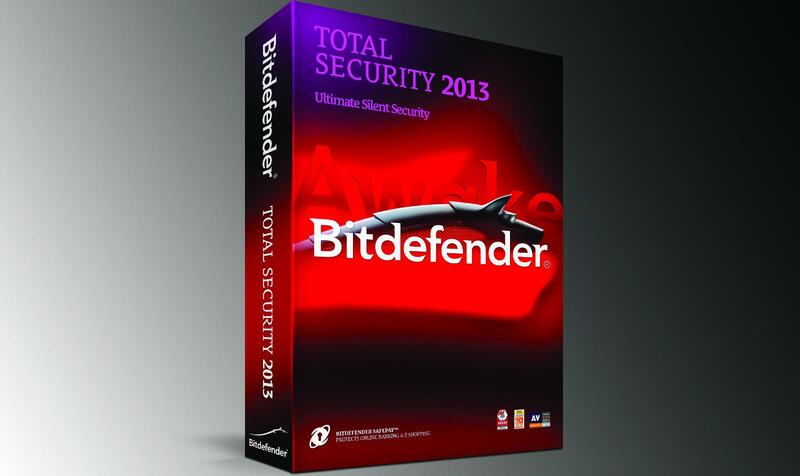 Once you’re updated and ready to roll, download Bitdefender 2013 from the Bitdefender website. (At the time of this writing, Total Security 2013 is available for pre-order at a cost of about $56.) The file is about 242MB, and shouldn’t take more than a couple of minutes to download. 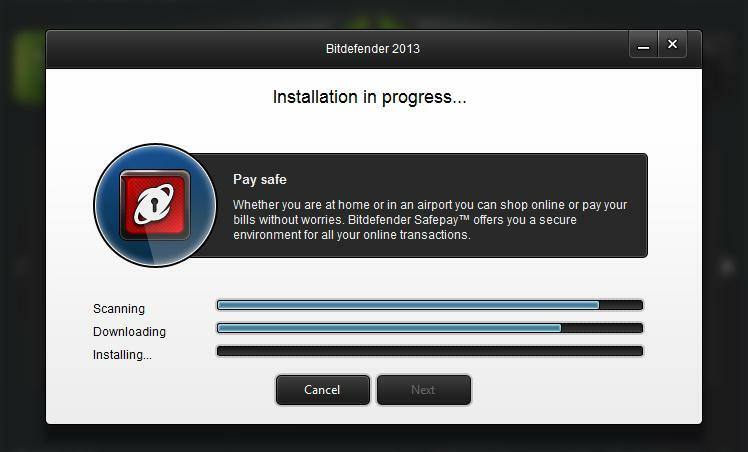 Bitdefender has made the installation process quite quick and painless. The company boasts “one-click” installation, but it does take a couple more taps on the mouse to complete the whole transaction. You’ll need to stay at your computer to click “OK,” or check a couple of option boxes — or more, if you choose the custom installation option — but the company has purposefully excluded too many choices at the start for simple installation. I chose the standard installation option for this test. The entire installation took slightly less than 15 minutes on my machine. Just remember: You’ll need to be connected to the Internet during the entire installation. Bitdefender 2013 requires that you create an account, which allows you to log onto your MyBitdefender dashboard on the Web. You can either create Bitdefender-specific login credentials, or choose to login with your Facebook or Google accounts. For simplicity’s sake, I chose to login with Facebook, which requires approving the app through Facebook. All of this is straightforward. Once installed, you’ll need to choose which protections you’d like to enable. The options include the following: antispam, firewall, antimalware, antiphishing, antifraud, and search advisor. Some of these specifically handle email and IM, others protect during Web browsing or your Internet connection in general. For the most thorough protection, obviously, you will want to enable all options, but the choice is yours. Turning these options on or off is a simple click, and you can manage them at anytime later. 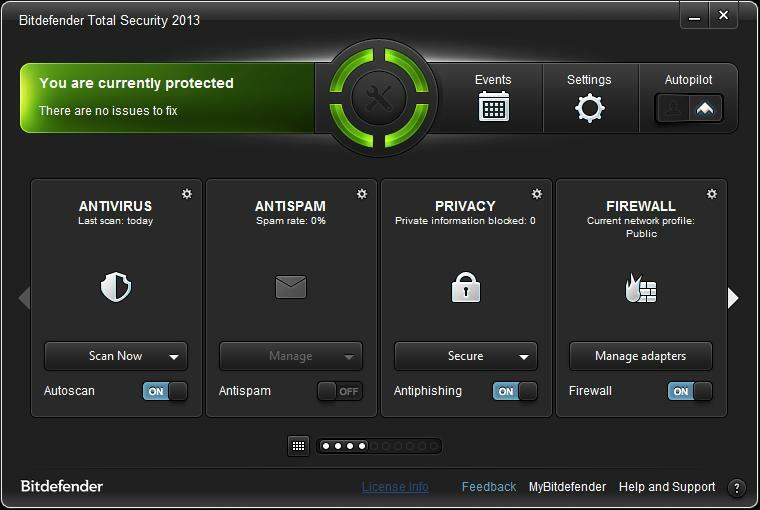 For 2013, Bitdefender has updated the UI to make it more customizable. The UI includes two main pieces: The primary interface, and the “security widget.” The primary interface window includes a colored indicator at the top, which tells you whether or not there are issues with your computer’s security. Green means everything’s good; yellow, and you have some non-urgent problems to take care of; red, and you could be in trouble, meaning you need to immediately clean your machine to remove the threat. The primary interface also gives you access to all the main features of the software, from virus scans to file encryption. The redesign now allows you to scroll through each widget, and reorganize them. (If you’ve used Tweetdeck, you’ll be familiar with how this works.) 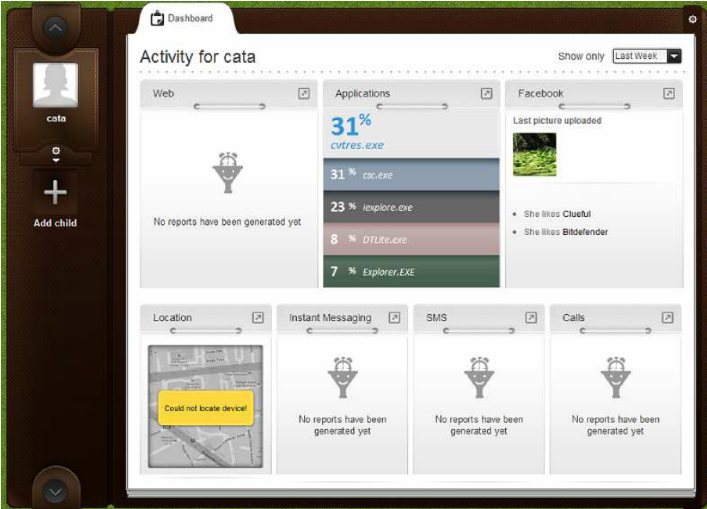 And of course, you can launch actions, like scans, through the primary interface. The security widget is made to sit in the bottom of your screen to provide a quick look at your current security status. You can also monitor firewall activity, view events and scan activity, and launch the primary interface from the security widget. I thought this feature was a nice touch — or, at least, a nice idea, as I wish it were a bit smaller and less distracting. If you’re on a laptop or simply have a small screen, the security widget will surely get annoying at some point. You can close it, of course, and leave the program running. But that kind of defeats the purpose of the widget. Quick Scan: Quick Scan simply checks all of the programs currently running on your machine, creates a list of them, and checks with Bitdefender’s database of these programs to see if they are infected. Bitdefender says that, “on average,” Quick Scan only takes about a minute to complete. Our initial test took much, much longer — in the neighborhood of an hour — but did get faster with subsequent scans, as promised. System Scan: This one is fairly self-explanatory — System Scan provides a thorough scan of your entire system to check for malware. This one takes longer than the Quick Scan, but provides a better check of your machine to make sure you’re operating virus-free. Vulnerability Scan: In this scan mode, Bitdefender 2013 checks the overall safety of your machine, including how safe your system passwords are, and whether or not your critical system software is up to date. Removable Device Scan and USB Immunizer: In light of the recently discovered Flame cyberweapon, which is passed along via USB drive (or other portable storage device), the Removable Device Scan and USB Immunizer functionalities are particularly welcomed. As you probably guessed, these features scan everything from CDs and DVDs to remote network drives to portable hard drives and USB thumb drives. If a USB or other portable drive is infected, 2013 can clean the malware out, making it safe — a new feature in 2013. Unfortunately for our purposes, none of the USB drives I had laying around contained malware, so I wasn’t able to fully test this feature. But assuming it works as promised, it’s a darn good idea — if for nothing aside from peace of mind. Rescue Mode: This one is for worst-case scenarios. If a piece of malware is detected during a scan that cannot be removed, users can enable Rescue Mode, which reboots your system in a stripped-down version of Linux, and removes the virus from the core of the machine. This is particularly useful for removing root-kits, which cannot be removed from within Windows. Bitdefender even installs the Rescue Mode functionality before installing the full 2013 suite, in case a piece of malware on the machine is specifically designed to prevent the installation of antivirus software. One of the main features of Bitdefender 2013 is Autopilot, which silently and automatically detects, quarantines, and removes malicious software from your machine. When turned on — you can easily switch autopilot on or off from the primary interface — Auto Pilot requires no user interaction whatsoever, a particularly useful feature for combating the latest malware, which can trigger certain functionalities on your machine that only make matters worse when an untrained user is involved in the process. Entirely new to the 2013 suite, Safepay is a super-secured browser for accessing particularly high-value websites, like your online bank or credit card accounts, or online retailers. 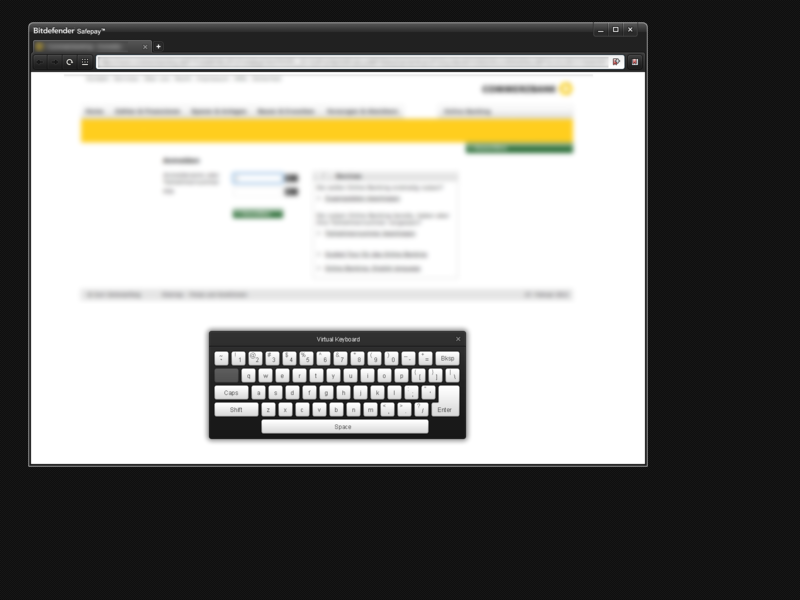 All online transactions done through Safepay are fully protected through a secure connection, preventing all types of malicious activity, including keystroke logging (with the added benefit of a virtual keyboard), phishing attacks, network spoofing, and automated screenshots. While Safepay is a stand-alone browser, it’s not meant to be used as your primary browser. Instead, Safepay will automatically launch when it detects that you are visiting a bank website, for example. You can then complete your transaction through Safepay, close it, and go about your business. Baked into Bitdefender 2013 is its Safego app, which scans your friends and followers, posts, and shared links on Facebook and Twitter to check whether anything (or anyone) poses a threat to your personal cybesecurity. While the Facebook functionality scans friends and shared posts and links automatically, the Twitter version allows you to scan individual users, as well — a nice touch. A quick spin with Safego delivered seven infected items through my Facebook account, and (shockingly) nothing but a couple of general warnings about how my Twitter account could be more secure. Safego was a bit quirky during my test, with a bit of freezing up and windows not loading. All problems corrected themselves after a couple of tries. And it’s impossible to know whether some of this was caused by a wavering Internet connection, or by the software itself. Regardless, when it worked, it seemed to work well. An increasingly popular feature in antivirus software, parental controls essentially allow parents to “keep tabs” on their children. (And, given what a recent study shows kids do online these days, who can blame them?) Bitdefender is no exception. The improved Parental Control feature, complete with an updated UI, provides parents a wide spectrum of ways to spy on their kids, including Web browsing activity, application monitoring, Facebook and IM monitoring, and the SMS text message and call monitoring. I wasn’t able to put this one through the ringer, sadly, but I do know one thing: I’m glad I grew up before software like this existed. Anti-theft: A new feature in Total Security 2013, anti-theft allows you to remotely lock, wipe, and locate your laptop. Antispam: Just like it sounds, this feature will sift out any malicious email messages on connected accounts. They are detected prior to landing in your inbox, so you won’t even know they were sent. Unfortunately, this one only works for on-board email software, including Thunderbird, Microsoft Outlook (2007, 2010), Outlook Express, and Windows Mail. Search Advisor: Checks results on all major search engines (Google, Yahoo, Bing) for malicious content, including phishing attacks, malware, fraudulent sites, and other “un-trusted” websites. Sandbox: Another new privacy control feature, Sandbox allows you to connect to the Internet in such a way that your operating system is cut off from the Web, protecting your machine from attacks. Identity Control: Not a new feature, but a useful one, Identity Control allows users to prevent the transmission of custom phrases or numbers. So if you tell the software to block any messages — IMs, emails, etc — that contain your credit card number, and such a transmission is detected, it will be blocked. IM Encryption: Encrypts all IM conversations — sadly, it only works with Yahoo Messenger. The Good: From a usability standpoint, Bitdefender Total Security 2013 maintains the first thing I like about Bitdefender products: They’re simple and straightforward. More importantly, Bitdefender’s virus scanning technology is some of the best in the business. And that’s one of the main aspects that’s going to keep someone from ruining your life through identity theft, or some other cyberattack. And finally, many of the new features with 2013 really are useful, and help keep me safe in a way that doesn’t require a lot of tinkering with the software, or reading the user manual. However…. The Bad: While the new UI is nice, I also had a few minor problems — things like windows not closing when I want them to, for example. Also, I was unable to get the Safepay feature to work properly. Safego had a number of quirks, including prolonged load delay. The limited IM encryption feature needs to expand. And my initial Quick Scan was anything but quick. Assuming these issues are fixed soon — and some of them, at least, may have already been sorted — I would definitely recommend Bitdefender Total Security 2013, especially for users who want to just let their antivirus software do its thing, and not think about it. That said, it has plenty of features and personal settings to satisfy those who like to have solid knowledge and control over their digital privacy and safety. And given its easy install, and 30-day free trial period, it’s at least worth a go.